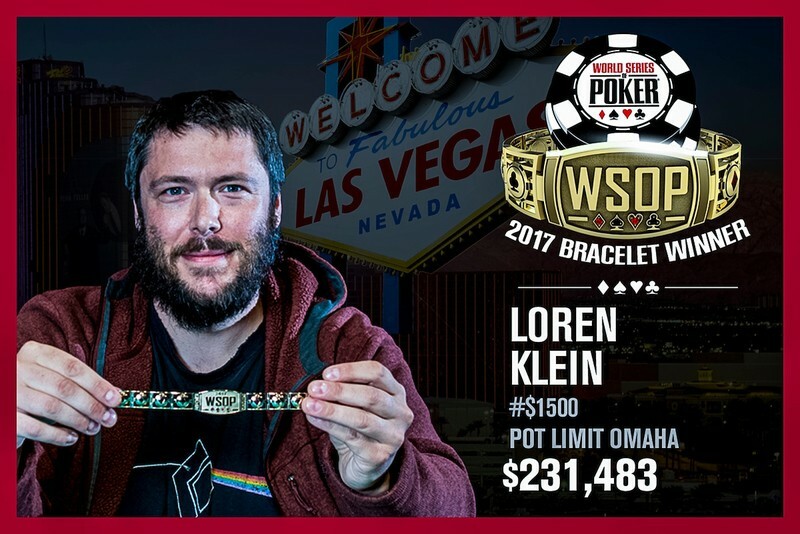 Loren Klein has put together quite the resume in events involving pot-limit Omaha at the World Series of Poker. Back in 2010, he placed second in a $2,500 pot-limit Omaha tournament. In 2016 he won the $1,500 mixed no-limit hold’em and pot-limit Omaha event for his first bracelet and $241,427. Then just a few days later he placed second in the $10,000 pot-limit Omaha championship event for the largest tournament score of his career: $552,713. Klein is back at it again in 2017. His latest conquest saw him outlast a field of 870 players to win a $1,500 pot-limit Omaha title, earning his second bracelet and the $231,483 top prize. Klein came into the final day in this event as the chip leader with 18 players remaining. There was plenty of stiff competition for Klein to contend with, including six-time bracelet winner Jeff Lisandro (16th – $7,995), another six-time WSOP champion in T.J. Cloutier (10th – $12,611) and former online phenom Jeff ‘yellowsub86’ Williams (4th – $71,423). Klein was able to survive to short-handed play, and following the dinner break he scored three consecutive knockouts to set up heads-up play, taking more than a 2.5-to-1 lead into the final showdown with Chun Law. on the river gave Klein the superior flush, earning him the pot and the title. Law hit the rail in second place with $143,017 for his efforts.